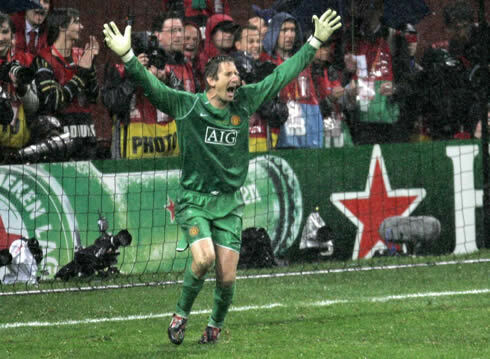 ﻿ Edwin Van der Sar: "Cristiano Ronaldo used to say that he wanted to be the best player in the World"
10.08.2011 » Van der Sar: "Ronaldo used to say that he wanted to be the best"
Edwin van der Sar made his retirement in the end of the last season, but he still has fresh memories from Cristiano Ronaldo impressive transformation since he arrived at Manchester. 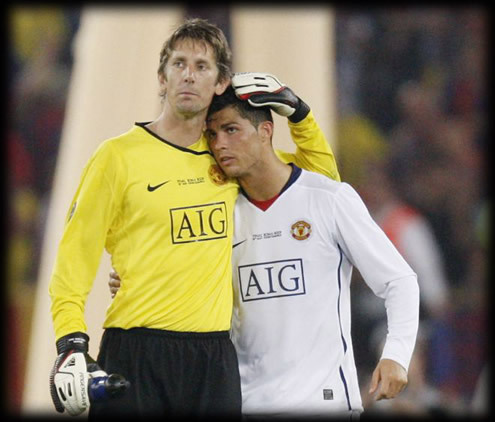 In Van der Sar's opinion, Ronaldo got to the place where he is now mostly because of his hard work in training. A lot have been said about how much Cristiano Ronaldo developped both as a player and as a man, under Sir Alex Ferguson orders in Manchester United. The boy who left Sporting Lisbon with only 18 years old, landed in Manchester to one of the biggest clubs in the World and never stopped chasing his biggest dream: becoming the best player in the World. However, Edwin van der Saar noted that Cristiano Ronaldo was well aware of the importance of giving everything and training to exaustion over the years and that was (and still is) the main reason why CR7 is now seen by many as the undisputed best player in the World, alongside with Barcelona's Lionel Messi. While Cristiano Ronaldo joined Manchester United in 2003, van der Sar joined the club in 2005, so he's a very well credited person to speak about the Portuguese training habits, since he witnessed in first hand, how Cristiano Ronaldo developped his skills and game awareness, year after year. Edwin van der Sar: "Cristiano Ronaldo already used to say back then, that he wanted to be the best player in the World, and probably a lot of players do the same, but I must say that CR7 really worked for that to happen. He was unbelievable when training, he never got tired of running after the ball and practice with a great intensity." Another player who recently praised Cristiano Ronaldo was Stewart Downing, the new signing from Liverpool. The 27 years old British winger, has very high expectations for next season and already knows who's footsteps he'll follow: "The top wingers usually perform at a very high level on a regular basis over the years. If we look at Cristiano Ronaldo or Ryan Giggs, they have been class players consistently and that's what I aim to do." Real Madrid started preparing the first clash against Barcelona this week, even though several players such as Cristiano Ronaldo, will represent their National Teams this Wednesday. Next Sunday (14th of August), CR7 will play the first leg of the Spanish Supercup against Barcelona, in the Santiago Bernabeu. This will be the first of two games against Barça and Cristiano Ronaldo is expected to be a starter. You can watch Juventus live stream, the game Real Madrid vs Barcelona free live streams inside the Live Games Streams section. Countdown clock for the game is shown in the top right corner of this site.